Life changed radically for a young Italian woman when she married an American soldier and moved to his farm in Iowa after World War II. 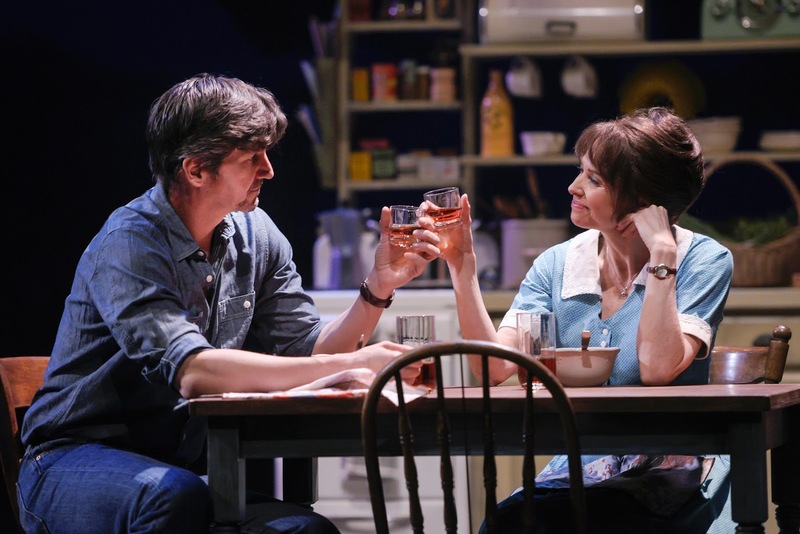 It changed again in 1965 when she met a handsome National Geographic photographer in “The Bridges of Madison County,” a musical presented by TheatreWorks Silicon Valley. By then Francesca (Joan Hess) and her husband, Bud (Timothy Gulan), had settled into a routine with the farm and their two teenagers to look after. The change began when Bud and the kids, Carolyn (Jessia Hoffman) and Michael (Matt Herrero), left for the Indiana State Fair, where Carolyn had entered the steer she had raised. Shortly after their departure, along came the photographer, Robert (Rob Richardson), on assignment to photograph Madison County’s seven covered bridges. He had found six, but not the seventh when he stopped by to ask for directions. When they were too convoluted to follow, she offered to take him there. When they returned, it was too late for him to have dinner in town, so she invited him to dine with her. Nothing happened then, but the attraction was apparent. So while he had to stick around a few more days to make sure his editor in New York was happy with his photos, passion and love blossomed. When it came time for her family to return, Francesca had to choose between staying with them or going with Robert. The choice wasn’t easy. All of this unfolds in the soaring music and lyrics by Jason Robert Brown with a book by Marsha Norman. It’s not entirely linear as it goes back to Francesca and Bud’s meeting in Italy and ahead at least a decade after the main story. The plot is based on a 1992 novel by Robert James Waller and was adapted into a 1995 film starring Clint Eastwood and Meryl Streep. In turn it was adapted into this musical that opened on Broadway in 2014. As directed by Robert Kelley, Hess, Gulan and Richardson are all convincing. The other seven performers create a variety of characters. Besides Hoffman and Herrero as Bud and Francesca’s children, the most noteworthy ensemble member is Maureen McVerry, seen mainly as Marge, Francesca’s nosy next-door neighbor. A skilled comic performer, she earns laughs as she focuses her binoculars next door, drools over the man who’s visiting there and tries to elicit a more than so-what response from her taciturn husband, Charlie (Martin Rojas Dietrich). Most of the singing is excellent, but Hess as Francesca is sometimes difficult to understand, perhaps because of the Italian accent. Musical director William Liberatore conducts the other nine orchestra members from the piano. Costumes by Fumiko Bielefeldt, lighting by Pamila Z. Gray and sound by Jeff Mockus enhance the production. The set by Wilson Chin allows for easy transition between scenes, but the abstract backdrop is distracting. Perhaps it’s meant to represent clouds or abstract trees, but it also looks like floating flower petals. Running about two hours and 40 minutes with one intermission, “The Bridges of Madison County” will continue through April 29 at the Mountain View Center for the Performing Arts, 500 Castro St., Mountain View.